During these final days of Advent, I continue to make a part of my prayer the collection of icons at the Chrysler Museum. Today I spent time pondering the Mother of God and her relationship to the mystery of the Nativity. Ivory from the Chrysler Museum in Norfolk, Virginia. After all Mary is an important dimension of our Advent spirituality. In fact the Proper appointed for this Sunday Mass and the Gospel of the Visitation point to the Virgin Mother. Skies let the just one come forth like the dew, let him descend from the clouds like the rain. The earth will open up and give birth to our Savior. 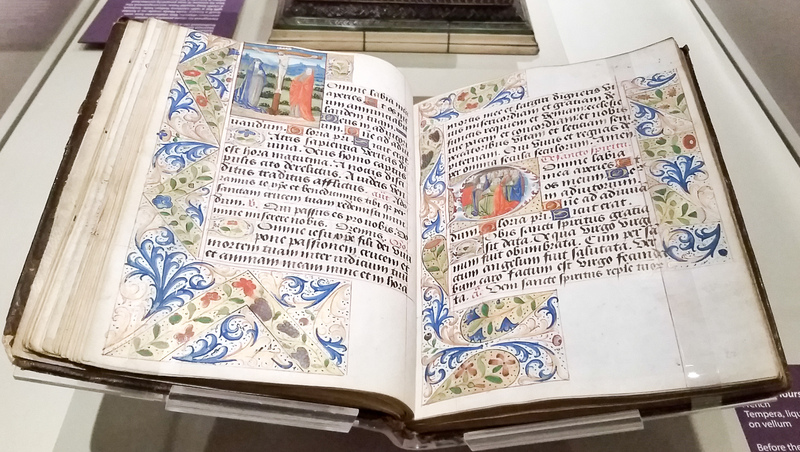 The Chrysler museum has a beautiful manuscript illumination of the Liturgy of the hours. 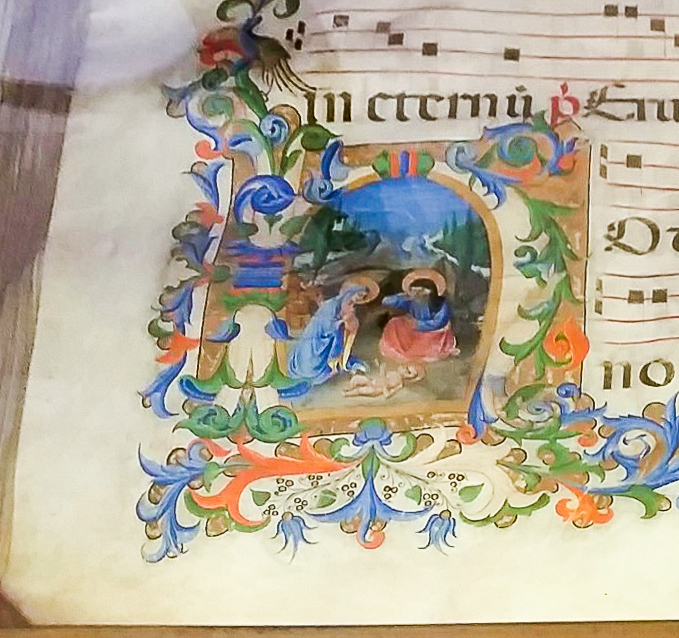 In the museum of the San Marco monastery in Florence are beautiful manuscripts. These manuscript illuminations radiate the beauty of the Annunciation as well as the coming solemnities of the Nativity and Epiphany. Come and shine on those who dwell in darkness and in the shadow of death. This is a fascinating short video from the Getty Museum on how illuminated manuscripts are made. 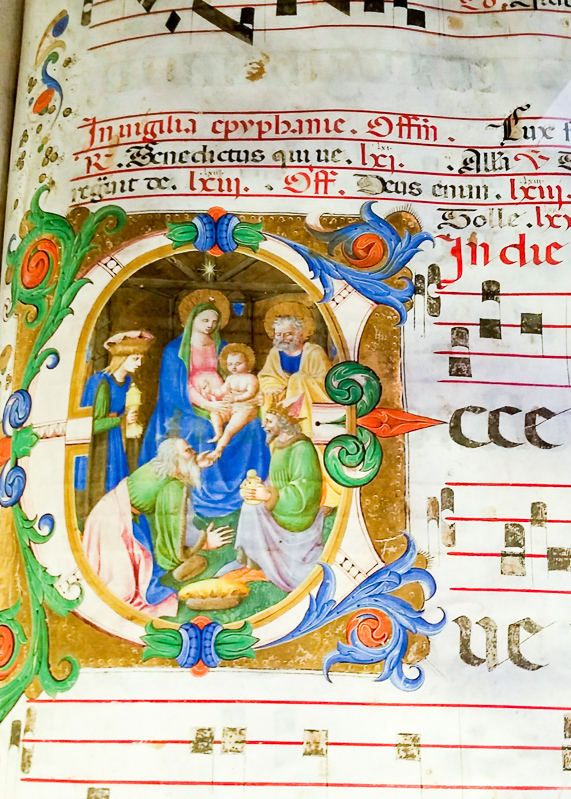 Finally, here is a lovely medieval setting of the Ave Maria. This chant can move our hearts to honor the Virgin Mother of God who gave birth to the Savior of the race. 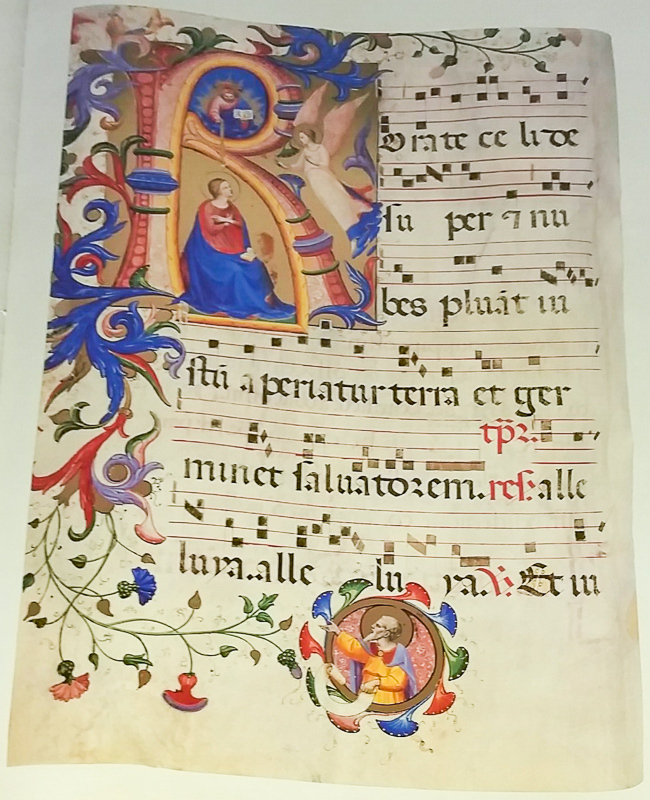 This entry was posted in Beauty, Christianity, Feasts and tagged Advent, Chrysler Museum, Florence, Illuminated Manuscripts, Mary, San Marco on December 20, 2015 by frjfkauffmann. The Chrysler museum has a very beautiful exposition of icons from the British Museum and the Museum of Russian icons in Massachusetts. On Gaudete Sunday we mark the halfway point of our journey through the Advent season in preparation for the celebration of the Solemnity of the Nativity of our Lord. During these final days of preparation we can experience this exhibit as an oasis of tranquility and peace in the midst of all the busyness that often distracts us from what is most important, that is, our life in Christ. When you enter the exhibition let an icon draw you into its gaze. Take a few moments and be attentive to the details. An icon can draw you into contemplation of the beauty of the Christian mystery. Take time to notice details that can stretch our religious imagination. There is a way of reading an icon, that, more than looking at art, draws one to contemplate the beauty of heaven, which is our human destiny. An icon can draw you into the mystery of the divine presence of God. This short video will help you read several icons and thus make your visit spiritually enriching. Also remember the upcoming presentation at the Chrysler, Sound of the Saints. This entry was posted in Beauty, Christianity and tagged Chrysler Museum, Gaudete, Icons on December 13, 2015 by frjfkauffmann. Icon of John the Baptist. This Byzantine icon, which dates to about 1300 A.D., is currently at the Chrysler Museum of Art. Who was Saint John of Damascus? This Doctor of the Church wrote treatises on the veneration of the icons against the iconoclastic Byzantine emperor. The Seventh Ecumenical Council, held in 787, upheld the teaching espoused by Saint John in these words, “Icons are to be kept in churches and honored with the same relative veneration as is shown to other material symbols, such as the precious and life-giving cross and the book of the Gospels”. When we first walk into the exhibit we encounter art that is Christian art but in a form that is unfamiliar to many Western Christians. However, icons are a part of the fulness of the patrimony of the Christian faith whose art embraces both the Orthodox east and the Latin west. This video will give you some insight into what an icon is and how it functions in the liturgy. Icons have a part in revealing the truth of the Christian mystery, within the Liturgy of the eastern church. As Christmas approaches, a visit to this exhibit would be a wonderful way to prepare spiritually for the celebration of the Nativity of the Lord. 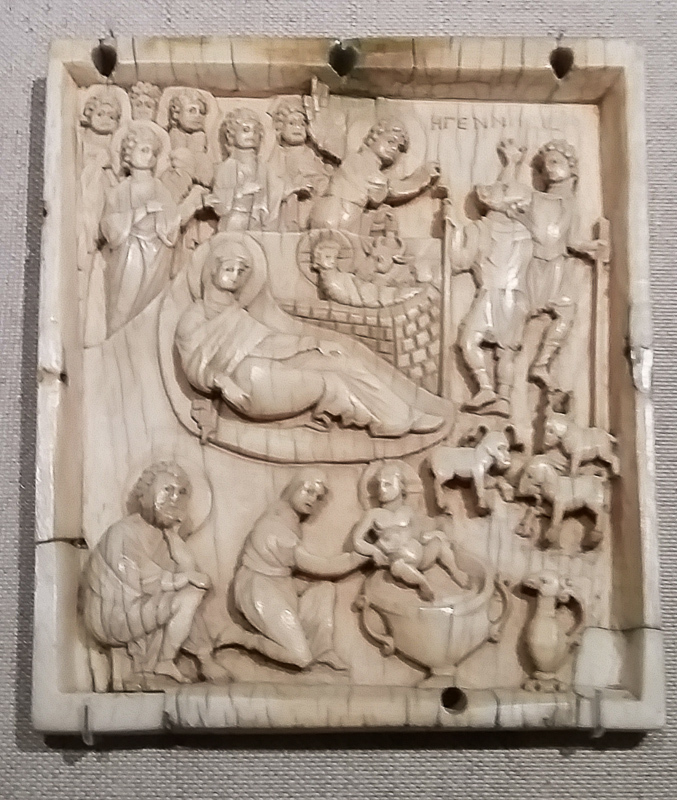 This entry was posted in Beauty, Christianity and tagged Chrysler Museum, Icons, John of Damascus, Norfolk, saints on December 6, 2015 by frjfkauffmann.